Koh Samui (Thailand) – May 16, 2018 (travelindex.com) – From 26th May until 2nd June 2018, the Samui Regatta will attract marine sports enthusiasts from around the world to Centara Grand Beach Resort Samui on the island’s idyllic Chaweng Beach. The now legendary annual yachting event showcases the skills of top international racers and regional yachting veterans over five days of exhilarating competition in the azure waters of the Gulf of Siam. 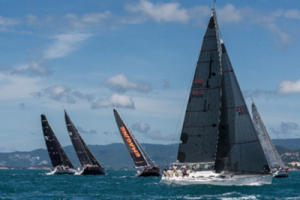 Now in its 17th year, the Samui Regatta has been hosted by award-winning Centara Grand Beach Resort Koh Samui since its inception, prompting members of the regional yachting community to refer to the resort as the ‘Home of the Samui Regatta’. Each year, a fleet of spectacular yachts sails in to Koh Samui, arriving with crew and yachting fans to experience some world-class sailing and enjoy the island’s glamorous social scene. The resort provides the perfect base for spectators, competitors and crew members to stay, relax and dine while also enjoying a full line-up of regatta parties during the event. “We’re proud to be the host of this truly international event as we welcome visitors from around the globe to enjoy our fabulous facilities and stunning island environment,” says Voytek Klasicki, General Manager Centara Grand Samui Beach Resort. “Koh Samui is Thailand’s most popular boutique island with good reason and the Samui Regatta has become part of its modern heritage with people returning year after year to enjoy the fun on and off the water,” he added. In the last decade, the Samui Regatta has grown to become one of Asia’s leading regattas and one of the best sporting and lifestyle events in Thailand, attracting strong racing, cruising and multihull fleets with around 500 participants from over 20 countries taking part. In the final event in the Asian Yachting Grand Prix Championship, the event generates around THB 18 million for the local Koh Samui economy annually. “It’s great to see such a competitive line up again this year across all the sailing classes. There are some very evenly matched boats and crews so I’m sure everyone will enjoy the five days of racing we have planned for them,” added Race Director, Simon James. As well as action on the water, the Samui Regatta attracts spectators and vacationers for its onshore social scene. Centara Grand Beach Resort, as host venue, ensures everyone from the crew to visitors, enjoys the resort’s facilities, services and world class cuisine. The official opening party is traditionally held at Centara Grand Beach Resort with free-flow drinks, snacks and great entertainment. During the competition, the Regatta Tavern, right in front of the host resort, opens for beachfront sundowners from 5-7pm runs Race Day Happy Hour with an open bar serving Samui Regatta signature cocktails, a huge range of isotonic drinks, canapes and more. It is a go-to meeting spot to check-out the day’s race results and presentations. The Samui regatta ends in style with an exclusive Gala Dinner for 500+ guests on the beachfront lawn at Centara Grand Beach Resort, with a delicious buffet, live music and awards presented by a guest MC. Tickets are included in the crew fees with some available to purchase, along with one-day social passes. Centara Hotels & Resorts have been welcoming visitors to Koh Samui for over 20 years and the Centara Grand Beach Resort Samui is the ideal regatta host venue. Sophisticated, and with a wonderfully nostalgic seaside air, the beachfront resort boasts chic bars and restaurants as well as stunning rooms and suites, including private-pool suites, as well as a spa; a timeless resort that is classic yet gloriously modern and reflects the contemporary culture of yachting tradition. Centara Hotels & Resorts is Thailand’s leading hotel operator. Its 58 properties span all major Thai destinations plus the Maldives, Sri Lanka, Vietnam, Laos, China, Oman, Qatar and the UAE. Centara’s portfolio comprises six brands – Centara Grand Hotels & Resorts, Centara Hotels & Resorts, Centara Boutique Collection, Centra by Centara, Centara Residences & Suites and COSI Hotels – ranging from 5-star city hotels and luxurious island retreats to family resorts and affordable lifestyle concepts supported by innovative technology. It also operates state-of-the-art convention centres and has its own award-winning spa brand, Cenvaree. Throughout the collection, Centara delivers and celebrates the hospitality and values Thailand is famous for: gracious service, exceptional food, pampering spas and the importance of families. Centara’s distinctive culture and diversity of formats allow it to serve and satisfy travellers of nearly every age and lifestyle. Over the next five years Centara aims to double its size with additional properties in Thailand and its new international markets, while spreading its footprint into new continents and market niches. As Centara continues to expand, a growing base of loyal customers will find the company’s unique style of hospitality in more locations. Centara’s global loyalty programme, Centara The1 Card, reinforces their loyalty with rewards, privileges and special member pricing.